Here you will find all our latest news. You can also keep up-to-date with things via our instagram, facebook and twitter pages (click on the links below to like and follow us). We also have mailing and text alert lists too. To be added to one of these lists, just ask! 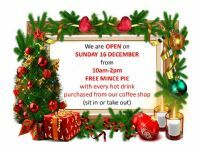 We are OPEN on Sunday 16 December from 10am-2pm for some festive shopping and FREE mince pies! 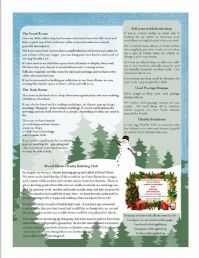 It's that time of the year again ... our annual newsletter! Pop-Up-Shop - 23 November - 3 December 2018 : Elaine from "Leafy Laine" will be holding a pop-up shop in our crafting workshop showcasing her lovely upcycled vintage furniture and furnishings. Silk Art Exhibition 21 November - 1 December 2018 : Local artist Mandy Shu will be exhibiting her work in our coffee shop area. Rhynie based Mandy paints local landscapes directly onto silk. We have been selling her work since January 2018 and are delighted to host an exhibition of her beautiful paintings. Remembrance Day 2018 : Huntly will be commemorating the centenary of the Armistice that ended World War I. There will be a day full of music, poems, memories and photos and all of Huntly's shops and businesses are invited to put a display in their windows. So far, we have seen many wonderful and colourful displays reflecting the lives of local people during the War. 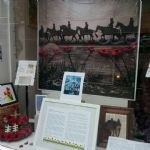 We put in a window telling the story of Ellie's great grandad, who was a lead horse gun carriage driver, serving from the very beginning of the War in Mons, Belgium; Gallipoli, The Western Front and finishing again in the Mons region. We also put stories about the horses and other animals who also served in the War. Saturday 1 September is Huntly's annual Hairst Festival where we celebrate all our local food producers and farmers who provide us with a whole feast of varied foods and artisan produce. We will be open from 8am for coffees and teas etc and we are holding 2 x drop-in workshops too: Make a small pottery pot and plant drawing. We hope to see you there! 16 August 2018 : Introduction of our Blog. We are often asked to explain what fair trade is, what ethical is etc... so Ellie has set up a blog in which she will explain some of the questions that we are often asked. You can find it at the bottom of our website via the Blog link. The first one briefly explains what fair trade is all about. If you have a related question that you would like us to blog about, let us know. 25 July 2018 : NEW STOCK ALERT! ... Really pleased to now be stocking Green Bridge Organics fairtrade coffee. Green Bridge is based in Findhorn, approx 40 miles from us here in Huntly. They purchase fairtrade arabica beans from all over the world and roast them locally, here in the North East of Scotland; so we can now offer our customers locally roasted fairtrade organic coffee! This fits in nicely with our ethos of sourcing both fairtrade and local products and produce. 20 July 2018: Sauces, pickles, chutneys, jams and honeys ... we have just added two new local ranges to our popular fairtrade jars; Rumlie Bees local honey and Huntly Herbs local jams, chutneys, sauces. Combine our sauces, pickkes and chutneys, jams and honeys with our fair trade rices, pastas and cereals for great tasting snacks and meals, morning noon and night! Oh my goodness, has it really been almost 7 months since I updated this page?! Sincere apologies to all but we have been very busy. I have been keeping our facebook, and instagram pages up-to-date but I have neglected our website. Well, what to say - the past 7 months have been hectic after our move into bigger premises. Our coffee shop / tea room is well patronised and our crafting workshops have been full to bursting! 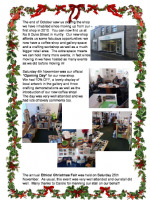 We have been involved in lots of local events and have increased the number of local crafters to almost 60. I am overhauling our website now with the aim of giving it a new lease of life and adding some of our new lines onto it so please keep watching this space! :) Ellie. 22 June 2018. 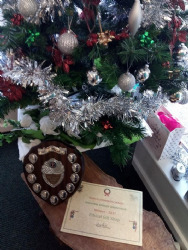 Christmas Window Competition Winner - we have today learned that we are this year's winner of the Huntly Christmas Window Competition - what a way to round of our 10th anniversary in business!! Local crafter, Zoe will be holding 2 table decoration workshops in #thebackroom of our shop. Both workshops are FULL. Details on our facebook page. Sunday 17 December 2017: Huntly Crafters Christmas Fair, Stewarts Hall, Huntly. 11-3pm. We will have a stall at this event. 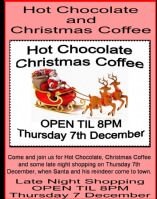 Come and join us for some Hot Chocolate or a Christmas Coffee and enjoy some late night shopping when Santa and his reindeer come to town. 2-17 December 2017 : Shop Small UK. We are taking part in the annual American Express Shop Small Campaign. American Express customers can get £5 credit to their account when they spend £10 in store with their card. 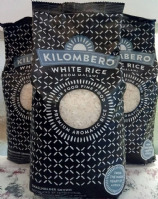 We have teamed up with the local secondary school to do the Kilombero Rice Challenge. Malawi is one of the poorest countries in the World. For a rice farmer to send one child to school for just one year, he needs to sell 90kg of rice. Let's help the school in its quest to sell 90kg of Kilombero rice before the Christmas beak and send one Malawian child to school for one year. Rice is £3 for a 1kg bag and is available in-store and the school. Tuesday 28th November 2017: Language and Culture Cafe 6.30-8pm. 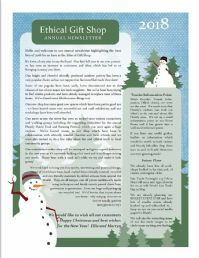 Saturday 25 November 2017: Ethical Christmas Fair, Stewart's Hall, Huntly 9.30-12.30. Local artists Rachel Ashton and Charlie Roy will be exhibiting some of their new artworks in the gallery space in our new coffee shop area "The Front Room". Pop along and view their beautiful art and enjoy a cup of fairtrade coffee on our upcycled furniture (which is also for sale). 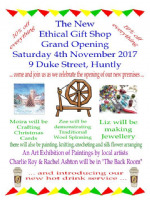 Saturday 4 November 2017: Grand Opening of our new Huntly shop! 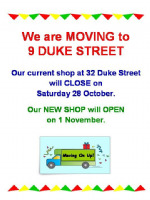 29-31 October 2017 : HUNTLY SHOP CLOSED TO FACILITATE MOVE TO NEW PREMISES. Online orders can still be placed but we will be unable to send them out until 1 November 2017. We are moving our Huntly shop to new premises - a new bigger shop which will enable us to make some big improvements to our business. We will be able to offer hot fairtrade drinks and have an exhibition space for hire too. a range of hand made natural soaps, body butters and hand creams made in the Scottish Highlands from natural, locally sourced ingredients. Contains NO palm oil, parabens, SLS, artificial colours or fragrances. Thursday 20th July 2017 : Local artist Judith will be watercolour painting in-store. Pop along for a chat and chocolates from 10am-1pm. MONDAY 10 JULY 2017 : 10% OFF EVERYTHING. As part of our ongoing 10th Anniversary Celebrations, our next 10% OFF EVERYTHING day is MONDAY 10 JULY 2017. Pop along to our Huntly shop and grab a bargain! You can also get 10% off on our online shop by entering the code 10july2017 at the checkout. Monday 5 June 2017 : our Huntly shop will be CLOSED today for the LOCAL HOLIDAY. FRIDAY 26 MAY 2017 : our Huntly shop will be open until 6pm. Ellie is now a Consultant with Neal's Yard Remedies - a company which produces a fabulous range of ethical and organic health and beauty products. These products share our ethos and are available in our shop and at all stalls and events which we attend. Have a browse through our NYR website to see this fabulous range of products (make sure you see our shop name in the top right of the screen). Please Note: This is a replicated website. When buying these products via our NYR website they are sent directly from NYR Organics and our terms and conditions do not apply. NYR Organics' terms and conditions are applicable and are available to view on this replicated website. This link is also available from our Health and Beauty Category. Shop with us on World Fair Trade Day and you could WIN £20 to spend in-store or online in our FREE PRIZE DRAW! In-store customers can enter at the till when purchasing their items between 09.30-17.00. Online customers will be automatically entered when completing their purchase at the checkout between 08.00-23.00. The winner will be picked at random on Monday 15th May 2017. GOOD LUCK! 6 May 2017 : Now stocking a fabulous range of Orgonite hand made from locally sourced materials. 6 May 2017 : Now stocking a small range of artist's materials, including canvases, paints, pencils and brushes. Our Huntly shop will be CLOSED MONDAY 1st MAY 2017 for the PUBLIC HOLIDAY. To make room for some new hot summer clothing lines, we are having a MASSIVE CLOTHING SALE. All clothing is reduced to clear - come grab a bargain! The nursery are having an Easter Bunny Trail. A bunny which has been decorated by one of the children is displayed in participating shop windows. The person who finds them all wins a prize! Here is our cute little hand made bunny! To celebrate 30 years of Where's Wally, the Orb's Bookshop, Huntly have put together a treasure hunt. An object relating to the Where's Wally books is hidden inside participating shops. Find them all and win a prize! Our item was Wizard Whitebeard's Scroll. SATURDAY 25 MARCH 2017 : PRIZE DRAW : Mother's Day Give-Away! Draw takes place @ 4pm. Win a gift basket for your Mum this Mother's Day. To enter, "like" and "share" our facebook post - or - "like" and "retweet" our twitter post - or - enter via our website - or - pop into our shop. Good Luck! Thursday 16 March Watercolour Painting with Judith McPhun, 10am-1pm. Judith will be painting some of her beautiful silk scarves on Thursday 16th March in-store. Pop along for a chat with her. This year's theme is all about having a fair trade snack when you get an attack of the munchies! To celebrate, we have loads of things planned. 1. Ellie has produced a wordsearch for the Huntly Primary School, based around some of the snacks you might eat which you can buy fairtrade and she has added some fun facts about them too - find it on our puzzle page. 2. Every day we will post a Fun Food Fact on our facebook and twitter pages. 3. There will be tasters available in-store throughout the fortnight so you can try before you buy. 4. There is a PRIZE DRAW to WIN A "SNACK PACK" hamper full of fairtrade sweets and treats. You can also enter this draw via this website - details on the home page. Proceeds go to local Huntly based charity Networks of Wellbeing. Draw takes place Saturday 11th March @ 4pm. 5. There is also a COMPETITION to WIN A JAR OF JELLY FAIRTRADE BEANS by guessing the number of jelly beans in the jar. You can enter this too via our website - details on the home page. Winner will be notified Saturday 11th March @ 4pm. Fiona from Networks of Wellbeing will be in-store Saturday 11th March @ 4pm - she will draw the prizes and announce the winners. We will also present her with the proceeds raised. 6. Friday 10th March is our next 10% off day - so come along and get money off your favourite fairtrade snack! 7. All the puzzles Ellie has produced will be available in-store for you to try out - no prizes for these, they're just for fun! There's lots to do and see in-store this fairtrade fortnight - pop along and join in the fun and try a free snack taster! Congratulations to Yasmin who won the hamper and to Paul who won the jar of jelly beans. There were 583 beans and Paul's guess was 610. Many thanks to Fiona from Networks of Wellbeing for helping us to do this and thanks also to Sandra, Chair of NoW who made the draw for us. Networks of Wellbeing is a Huntly based charity (No. SCO21861) that supports people experiencing mental distress. They work to promote positive mental health and wellbeing throughout our local communities and run a packed schedule of various community based activities. We raised a total of £41 for them which will be put towards their Intergenerational Projects designed to promote an awareness of the similarities between us - whatever our age or appearance. These projects involve both young children and older folk spending time with each other to break down the social barriers and misunderstandings between generations. Our Huntly shop will be CLOSED SATURDAY 18th FEBRUARY 2017. Delighted to announce that we are now stocking the fabulously beautiful stained-glass artworks from local crafter, Carol - Bahill Glass. Available in-store only at present - will be available online soon. New Range of hand painted glassware and artwork by local crafter, Robbie - Rustico d'amore. Available in-store only at present - will be available online soon. For almost two years now, we have been selling hand made soaps from local charity Inspire Soaps, Inverurie, Scotland. This charity supports adults with learning difficulties to overcome the obstacles they face in everyday life with the aim of helping them into work. They are a registered Scottish Charity (No: SC000038) and their website is : http://www.inspireptl.org.uk. Each soap contains a little message from one of the adults supported by this charity. To date we have raised £579.65 for Inspire from the sale of these lovely soaps through our shop. We are delighted to be able to offer them to our online customers too. The early bird catches the worm! 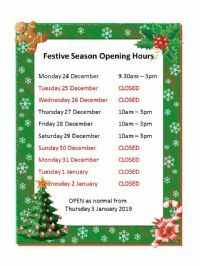 Due to some unforeseen transport circumstances as well as a good dumping of snow, the shop will have extended opening hours from 8am-6pm on Friday 13th January. Who knows - this could be the start of a regular thing! 2017 sees our 10th Anniversary in business. To celebrate we are introducing a 10% off day on 10th of each month. Come along and grab yourselves a bargain! Spend £10 in our Huntly shop and get £1 back off your purchase. We will be represented at this event by our good friend, Carole. She will be taking a box of our Fair Trade and Ethical items and manning a stall here on our behalf - thanks Carole! 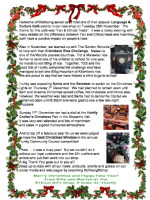 Why not pop along and get some fair trade and ethically produced items for Christmas. We are delighted to now be stocking a fabulous range of children's clothing designed and hand made in Glass, by Huntly. The clothing is made from fleece and is warm, cosy and colourful! Thank you Dealan-de Designs for choosing us! We are hosting an "Artists Day" in our shop on Thursday 8 September 2016. Local Artists Rachel, Moira and Judith will be painting in-store from 10am - 1pm. Come along and get some hints and tips and maybe have a go yourself! Free nibbles, tea and coffee. We are delighted to be stocking these fabulous candles from just down the road in Keith, Morayshire. The beautiful Mulderie Wood has inspired the name and scents of these candles. They use eco-soya wax in all their candles. It is made from 100% pure soy oil derived from sustainably grown soybeans, and is free from pesticides, genetically modified materials and herbicides. They contain no animal products and are not tested on animals. Here is a link to their website for more information. We are delighted to announce that we now stock a brand new range of cards produced by local author, children's storyteller and after dinner speaker, Deborah Leslie. Deborah is passionate about the wonderful Doric language native to North East Scotland and is famous throughout the area for her fabulously entertaining after dinner speeches. She is also the region's official children's storyteller. She has just produced this cracking range of greetings cards written entirely in Doric (with English translation) and we are very pleased to be one of her stockists. We also have a range of her books which she has signed especially for us. Keep up-to-date with Deborah and her Doric ditties on her facebook page. 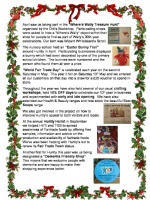 We are one of the 33 local Huntly shops taking part in the Huntly Express Summer Bug Hunt. This event runs all the summer holidays from 1st July - 12 August. Why not take the kids on a fun walk around Huntly and see if you can discover the little bugs hiding in the shop windows and who knows you may win one of the prizes! Entry forms available in all participating shops. Entries in to the Huntly Express offices by end of 12 August. Hurry before the little bugs all fly away! Here is a pic of Ellie with our little bug!